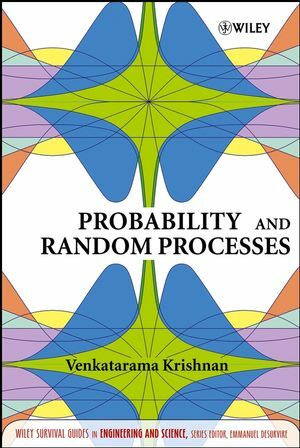 This survival guide in probability and random processes eliminates the need to pore through several resources to find a certain formula or table. It offers a compendium of most distribution functions used by communication engineers, queuing theory specialists, signal processing engineers, biomedical engineers, physicists, and students. More than 400 figures drawn to scale assist readers in understanding and applying theory. Many of these figures accompany the more than 300 examples given to help readers visualize how to solve the problem at hand. In many instances, worked examples are solved with more than one approach to illustrate how different probability methodologies can work for the same problem. Several probability tables with accuracy up to nine decimal places are provided in the appendices for quick reference. A special feature is the graphical presentation of the commonly occurring Fourier transforms, where both time and frequency functions are drawn to scale. This book is of particular value to undergraduate and graduate students in electrical, computer, and civil engineering, as well as students in physics and applied mathematics. Engineers, computer scientists, biostatisticians, and researchers in communications will also benefit from having a single resource to address most issues in probability and random processes. VENKATARAMA KRISHNAN, PhD, is Professor Emeritus in the Department of Electrical Engineering at the University of Massachusetts Lowell. Previously, he has taught at the Indian Institute of Science, Polytechnic University, the University of Pennsylvania, Princeton University, Villanova University, and Smith College. He also worked for two years (1974–1976) as a senior systems analyst for Dynamics Research Corporation on estimation problems associated with navigation and guidance and continued as their consultant for more than a decade. Professor Krishnan's research interests include estimation of steady-state queue distributions, tomographic imaging, biosystems, and digital, aerospace, control, communications, and stochastic systems. As a senior member of IEEE, Dr. Krishnan has authored three other books in addition to technical publications. Chapter 1: Sets, Fields, and Events. 1.3 Set Algebras, Fields, and Events. Chapter 2: Probability Space and Axioms. 2.4 Total Probability and Bayes' Theorem. 4.9 Summary of Discrete Distributions. 5.1 Definition of Random Variables. 5.2 Determination of Distribution and Density Functions. 5.3 Properties of Distribution and Density Functions. 5.4 Distribution Functions from Density Functions. Chapter 6: Continuous Random Variables and Basic Distributions. 6.4 Normal or Gaussian Distribution. Chapter 7: Other Continuous Distributions. 7.8 Chi and Other Allied Distributions. 7.17 Summary of Distributions of Continuous Random Variables. Chapter 8: Conditional Densities and Distributions. 8.1 Conditional Distribution and Density for P(A) = 0. 8.2 Conditional Distribution and Density for P(A) ≠ 0. 8.3 Total Probability and Bayes' Theorem for Densities. Chapter 9: Joint Densities and Distributions. 9.1 Joint Discrete Distribution Functions. Chapter 10: Moments and Conditional Moments. 10.3 Means and Variances of Some Distributions. Chapter 11: Characteristic Functions and Generating Functions. 11.2 Examples of Characteristic Functions. 11.4 Examples of Generating Functions. 11.7 Table of Means and Variances. Chapter 12: Functions of a Single Random Variable. 12.2 Distribution of Y = g(X ). 12.3 Direct Determination of Density fY (y) from fX(x). 12.4 Inverse Problem: Finding g(x) Given fX(x) and fY (y). 12.5 Moments of a Function of a Random Variable. Chapter 13: Functions of Multiple Random Variables. 13.1 Function of Two Random Variables, Z = g(X,Y ). 13.2 Two Functions of Two Random Variables, Z = g(X,Y ), W = h(X,Y ). 13.3 Direct Determination of Joint Density fZW(z,w ) from fXY(x,y). 13.4 Solving Z = g(X,Y ) Using an Auxiliary Random Variable. 13.5 Multiple Functions of Random Variables. Chapter 14: Inequalities, Convergences, and Limit Theorems. 14.2 Chebyshev and Allied Inequalities. Chapter 15: Computer Methods for Generating Random Variates. Chapter 16: Elements of Matrix Algebra. 16.1 Basic Theory of Matrices. 16.2 Eigenvalues and Eigenvectors of Matrices. 16.3 Vectors and Matrix Differentiations. Chapter 17: Random Vectors and Mean-Square Estimation. 17.2 Moments of Random Vectors. 17.3 Vector Gaussian Random Variables. 17.4 Diagonalization of Covariance Matrices. 17.5 Simultaneous Diagonalization of Covariance Matrices. 17.6 Linear Estimation of Vector Variables. 18.2 Estimation of Random Variables. 18.3 Estimation of Parameters (Point Estimation). 18.4 Interval Estimation (Confidence Intervals). 19.4 Estimation of Parameters of Random Processes. Chapter 20: Classification of Random Processes. 20.1 Specifications of Random Processes. 20.7 Wiener Process (Brownian Motion). 20.12 Aperiodic Random Process (Karhunen–Loeve Expansion). Chapter 21: Random Processes and Linear Systems. 21.1 Review of Linear Systems. 21.2 Random Processes through Linear Systems. 21.4 Bandpass Stationary Random Processes. Chapter 22: Weiner and Kalman Filters. 22.1 Review of Orthogonality Principle. Chapter 23: Probabilistic Methods in Transmission Tomography. 23.8 References for Chapter 23. A: A Fourier Transform Tables. C: Inverse Cumulative Gaussian Tables.